From the moment I saw that epic bunny yawn followed by an unexpected bunny flop, I was hooked by the magical world of rabbits. Growing up, I had wonderful relationships with all of my rabbits, especially Hershey, who passed away just before he turned 13. I made very little effort to gain his trust yet from the day he entered my life until the day he passed, he remained my most devoted companion. While I was grieving Hershey's loss, a friend suggested I might find comfort in visiting the rabbits at a nearby shelter. The idea surprised me. I was unaware of the shelter's existence; I didn't even know that rabbit adoption was possible through such organizations. 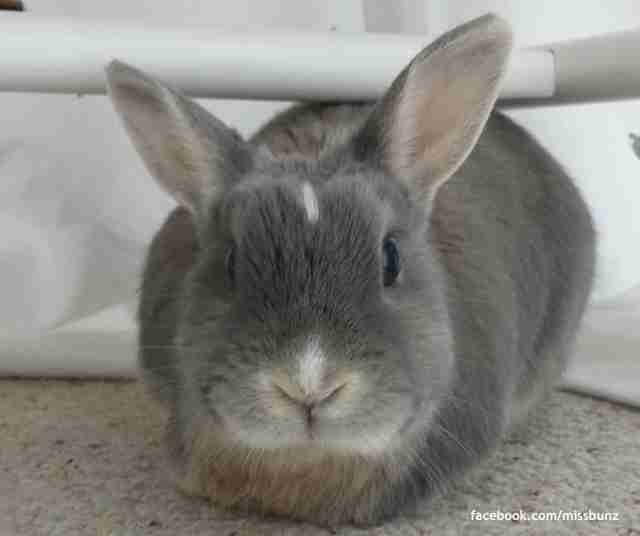 My friend's advice led me to Miss Bunz, a fiercely independent crème d'argent dwarf mix. 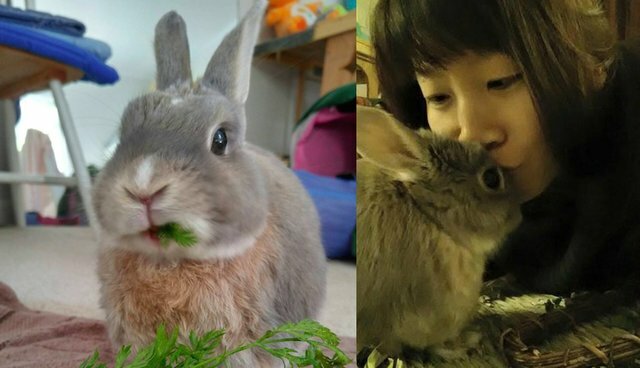 At just three years old she had spent her entire life confined in a cage with another rabbit, before being abandoned when her owners moved away. The bunny I know now is the not the same bunny I met in 2012. 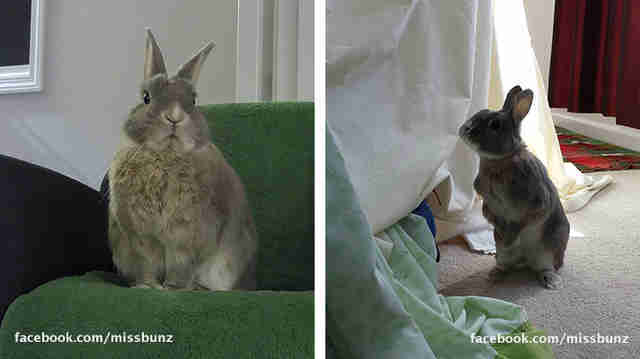 When we met, Miss Bunz was skittish and distrustful of people. When I approached her cage, she would dart into the back corner to hide. She despised being touched, could not be tempted with food and would bite when she was afraid. 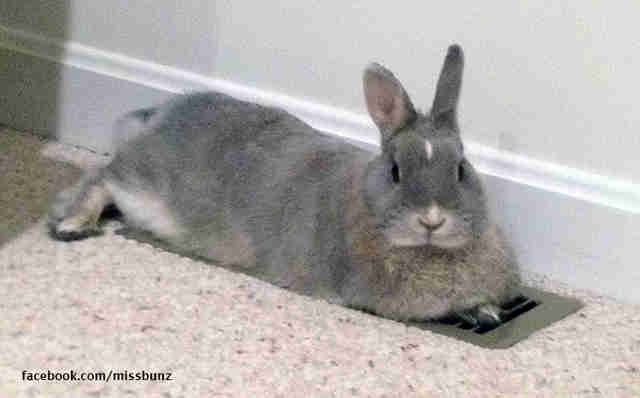 During her first weeks with me, she would hop over to the vent and flop across it when I opened her cage door. Her behavior seemed odd; it was springtime and I wasn't running the heat or the AC. When I saw the sore hocks on the bottom of her feet, I realized with growing sadness that she was used to being cooped up in a cage. The feeling of the metal grate was all she knew. From a young age, I was accustomed to socialized rabbits who enjoyed affection. 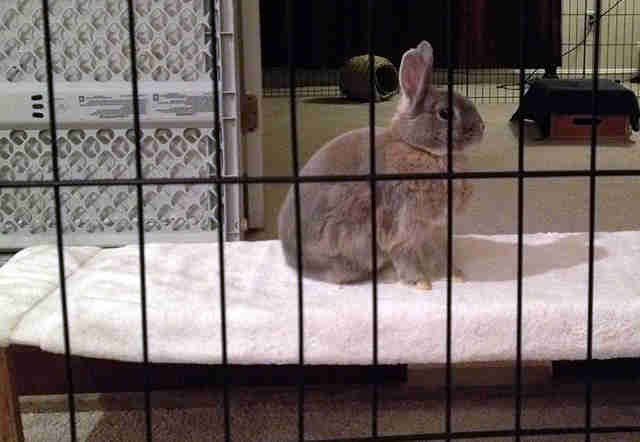 Miss Bunz, on the other hand, was used to being left on her own and ignored. 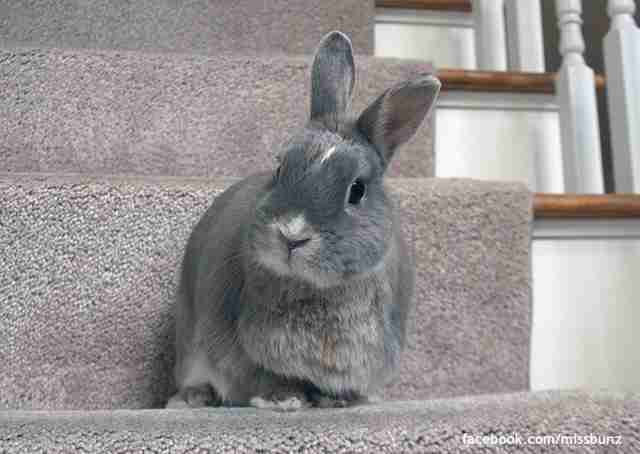 I cried on more than one occasion and wondered if I had made a mistake by adopting a rabbit with a broken past. Life with Hershey and my other bunnies had been effortless. They appreciated my company while Miss Bunz put as much distance between us as possible. The first time she bit me, it stung. Not just physically, but emotionally. Despite having spent 20-plus years around rabbits, I had never been bitten by one before. Miss Bunz didn't bite to be vicious. She bit me because she felt threatened and that gave me a sorrow I had not yet experienced. I thought I was giving her a good home and a sense of security. And so her bite, her perception that I was a threat, left me feeling rejected. Then there was the morning she injured herself while attempting to escape from me. As I tried to put her back in her cage, she became spooked. She ran so quickly that she couldn't quite take the corners of the room and ended up slamming into the wall. But that didn't stop her momentum or need to flee. She bounced off the wall and, without pausing, continued to run at top speed until the she hit another wall. Finally, dazed and bleeding, she sat frozen while I scooped her up to look at the damage. Her injuries weren't serious (a few broken nails) but the episode left her more fearful and leery of me. With each incident, my frustrations grew and I even voiced the possibility of taking her back to the shelter. But my friends were sympathetic to Miss Bunz, and one said to me, "She's never had a friend like you." When I heard those words, my thoughts changed in an instant. My friend was right. Miss Bunz had never had someone like me in her life and she didn't know what to make of it. Her experiences with humans had led to disappointment. Was I going to give up and let her down the way others had? No. I couldn't do that to her. I became determined to find a way to make it work and keep us both happy. Early on, I gave Miss Bunz too much space to explore. When she was out of her cage, she could go anywhere in the room. While ideal for exercise, it was not ideal for socializing. It was too easy for her to run and hide. Fortunately, it was a mistake that could be corrected. I started using exercise pens. The smaller area made it harder for her to avoid me as I sat inside the x-pen with her. Instead of reaching out to pet her, I waited until she approached me. Bunnies are curious. It didn't take her long to notice me. With each tentative step, she leaned toward me with ears forward and sniffed the air. When she reached me, she put one paw on my leg, sniffed and quickly hopped away. After a few hops, she looked back, as if she was expecting me to give chase. I didn't. Time in the x-pen became a daily routine. During feedings, I touched her gently while she was distracted by food. On days when the hours felt short, I napped on the floor inside the x-pen. 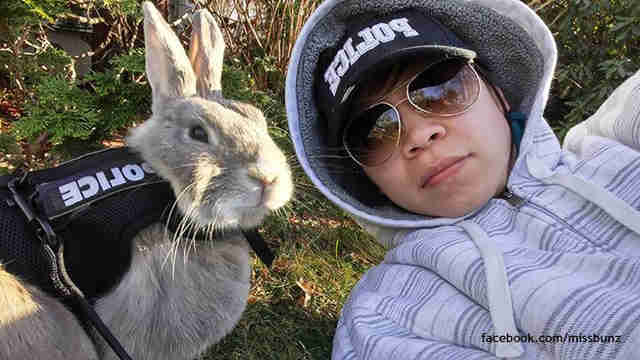 When I did this, Miss Bunz became more comfortable with my presence. She initiated more contact and I often woke when she nudged my feet or put her paws on me, or when her whiskers tickled my face. Within a month of starting our new routine, I noticed positive changes. Miss Bunz no longer waited cautiously for me to put her food down before digging into it. One day, as I bent down to feed her, she stood tall on her hind legs. She didn't hesitate to put her paws on my thigh and take the food directly from my hands. She stopped flinching when I touched her and she sat still as I rubbed her head. It was no small feat for an animal with her history to accept human contact. 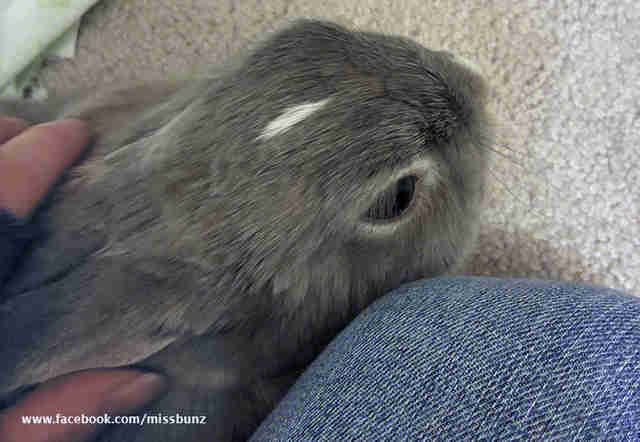 If Miss Bunz was willing to trust me, I was willing to trust her. I added more x-pens to her space and extended her time outside of her cage. As she became more socialized and interested in contact, she earned more freedom. Eventually, I got rid of her cage and she stayed in her room. The x-pens prevented her from roaming into other parts of the house but, over time, I put the x-pens away. Nowadays they gather dust in the basement. Something significant happened shortly after Miss Bunz became a free-range bunny.By then, she was used to me and permitted me to pet her regularly, though begrudgingly so. But beginning that day, she didn't just brace herself to accept the head rub. She actually leaned toward me, put her head down and invited me to pet her. As I stroked her soft fur and thought about how far we'd come, I heard a delicate and unfamiliar sound. Puzzlement gradually became elation. I was listening to a tooth purr! Some bunnies grind their teeth softly to show enjoyment while being pet. Coming from Miss Bunz, the tooth purr was a great compliment as well as an affirmation of our slowly blossoming relationship. In our four years together so far, Miss Bunz has grown into a trusting and loyal member of the family. When I'm home, she follows me from room to room. If I watch TV, she plops under the coffee table to join me. When I arrive home later than expected, I often find her waiting for me in her chair. And to my delight, when I go to sleep, she hops up the stairs and creeps under the bed to be near me. Miss Bunz was not the only one to undergo a transformation. At the start of our journey, I was just another pet owner, but I have since matured into a pet parent. Before Miss Bunz, I considered myself a very capable caretaker. My pets were loved and well fed, and lived in comfortable conditions. But taking in Miss Bunz and earning her trust meant a higher level of commitment. I learned to make careful and informed choices about what's best for her, in matters like diet and vet care, whereas my former self would have chosen what's convenient for me. And paying attention to Miss Bunz is more than just caring for her basic needs. It means offering enrichment and finding things that she likes to do. For instance, when I discovered Miss Bunz loves the outdoors, I was able to harness train her. 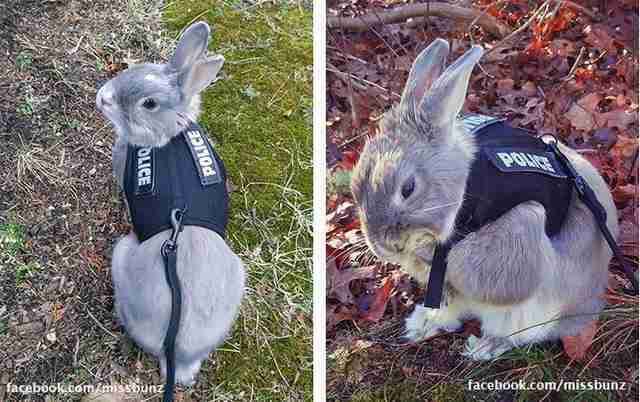 The neighbors still get a good laugh when they see her hopping across the yard with the word "police" stamped across her harness. 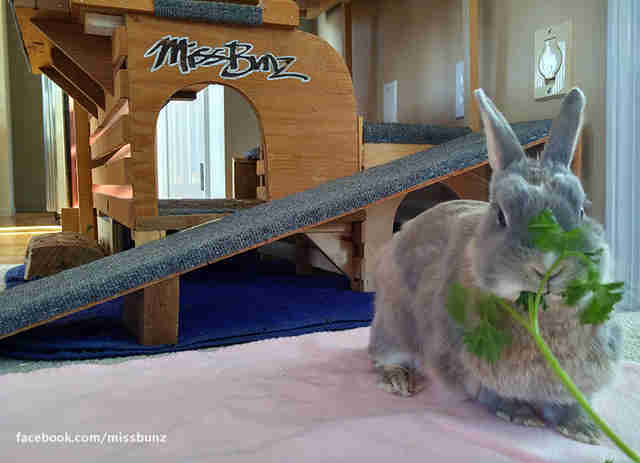 Adopting Miss Bunz introduced new challenges for which we were both unprepared. We were each set in our ways but, in order to thrive in each other's company, we had to adapt. I learned what it means to be a pet parent, while she learned to accept a human friend. We both learned that with patience, determination and love, you actually can teach an old bunny (and her pet parent) new tricks. Miss Bunz's life and experiences have caught the attention of many across the globe, including a Disney animation director and the judges of the national "Real Trix Rabbit" contest. 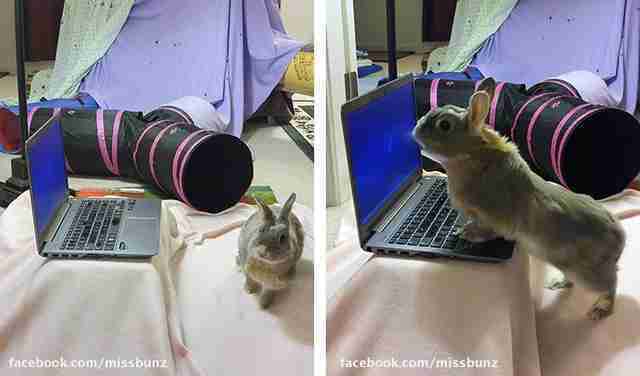 For more of her adventures as a free-range house rabbit, follow Miss Bunz on Facebook or Twitter.